Doesn’t that sound like a great topic for a Monday?! When I show you the “infographic” you’re going to smile, too, and then you’ll really be in the right frame of mind to make the most of this concept. I trust you will want to share it, as soon as possible, with your employees and colleagues. This is important information! 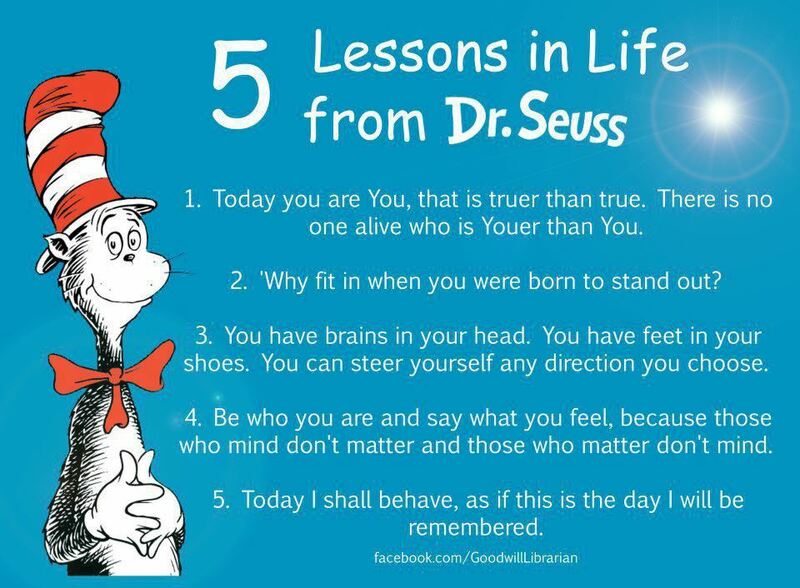 I expect you didn’t think Dr. Seuss would be the kind of expert I would use to promote how to encourage brand loyalty and employee engagement. I doubt that he wrote this list with business in mind, but when a business promotes a philosophy that can be related to a way of life, then doesn’t it make sense that the same guidelines should apply? When we as consumers think of the industries that are truly inept in the customer service game, the airlines industry has to be at the top of the list. Constant nickle and dime-ing, frequent delays, expensive rebooking, lost luggage, ticket agents from hell, ornery stewardesses– I don’t need to go down the list to drive my point home. They are quite simply, the worst. But it is in that same breath that I will give credit to when credit is due. As the hyperlink to this article points out, on March 18, passengers aboard a Delta Airlines flight from Boston to Atlanta found themselves stuck on the tarmac for 3 hours!!!! due to inclement weather. Instead of telling passengers to smile and bear the customer beat down (per usual), the pilot called in 60 pizzas for the passengers to make the wait more bearable. For customers trained to expect airlines to top on fees and delays, the sight of pizzas topped with delicious pepperonis and mushrooms must have been a welcome departure. A gesture like buying pizzas for your airplane during a long delay is admittedly a small and relatively inexpensive gesture, but if these practices become an industry standard, the airline industry, and particularly Delta Airlines, may be on their way toward redirecting the embarrassing record of customer experience to a more desirable destination. I love Apple. I wouldn’t say I’m one of the cult followers that Gallo describes in his book, but I can definitely understand those people who are. I don’t think I’ve ever walked passed an Apple store without going in, largely for the reason that it truly is an enjoyable experience to be immersed Apple culture. I probably visited the store 100 times for various reasons without a single bad experience—until recently. After waiting another 10 minutes, someone finally came to help me. He apologized and quickly ran a systems check that didn’t show any problems. After the check was over, the computer crashed again. Although he couldn’t figure out what was wrong, he said he could send it to their shop to run some tests and fix the problem. He ultimately told me it would take about 5 days to fix. Today, 7 days later, I finally got my computer back. I know this is not a typical Apple experience by any stretch of the imagination but it is a good example of how even leaders in customer satisfaction can fail from time to time. This experience has introduced a level of fallibility in my previously unfailing perception of dependability. This experience also illustrates how one bad experience carries so much more weight than a good one. What If Big Data Is Wrong? One of the many accounts I follow on twitter is @petechasmore of Mashable. Beside being a prolific tweet for the social new aggregate he is also I pretty funny dude. More than a couple of times a day I click on a link and browse at a Mashable post (or at least leave it in a lonely browser tab). While it’s not a big sample size (or really anything more than a thinly veiled advertisement for Enliken) it does pose an important question. What if all this data we’re collecting, that we’re spending all this money and time to analyze, isn’t actually correct? Curious to see what my data says about me I took the quiz too. According to Enliken advertisers are about 59% correct about my likes and dislikes. Some of them it’s pretty obvious why they are there. Sure, I google and read about finance–but it’s not an interest of mine. That’s pedantic, but some were really off base: I don’t speak Spanish, I’m not a car buff, or, gods forbid, looking for parenting advice. I sure do like southeast Asian food, so they got that right. Business Success Begins With Market Research – Online Surveys are a MUST!! – Advantages: Respondents obtain a hard-copy of the survey. – Disadvantages: Relatively expensive with often poor response rates. – Advantages: May persuade respondents to participate. – Disadvantages: Expensive and time-consuming. – Advantages: Interaction with respondent in real-time. – Disadvantages: Extremely costly and time-consuming. Last week, I interviewed senior marketing and brand strategy manager at Porsche (China) Motors Ltd , and we had a very interesting conversation about the overall low customer satisfaction rate in luxury products market. I asked why the customer service are always less than satisfactory while they have time and resources to train employees better. Isn’t customer service important in luxury goods industry?” Ms.Yang said that the “less-than-satisfactory” customer service is exactly part of the marketing strategy of many luxury brands. In the psychology perspective, just the right amount of unsatisfactory in the purchasing process will maximize customers’ happiness after they get the products. In their employee training program, the employees are always told not to talk too much to their customers, not to get too close to their customers, even not to smile too much. Also, their are many companies intentionally prolong their delivery time, emphasizing their superior quality and complicated manufacture process: It used to take up to 36 years to get a Hermes Birkin bag; it takes several years to get a designed sports car; it takes 1-2 years to get a “Vertu” cellphone, etc. If we compare the customer satisfaction rate across all the industry, luxury goods industry is probably the one that care about their customers the least. However, It is always brand/marketing managers’ job to find out customers’ “limit”: they have to make sure that their “poor” customer service won’t make their customers leave their business. That explains why luxury stores always have fancy decorations but only have one or two salespersons, in which way they keep their customers waiting but at the same time make sure they enjoy the waiting time. Luxury goods, as a unique segment of markets, are always running their business in their own ways. And no matter how many sweet old ladies they put at the check in counter, it cannot by any means come close to countering their terrible customer experience. Allow me to spin a quick yarn of one of my recent flight experiences. Being originally from the west coast, I make quite a few flights back and forth across the country. And most of the time, I tend to fly a particular airline because of the lower fares and availability of flights directly in to Cha0rlottesville. Since I respect anonymity we’ll hid the brand’s identity. Let’s call them United Airplane Flying Company (United for short). Well, the last time I flew United from California to Virginia, I had a stop over in DC, normal for cross country flights. Unfortunately there was a mechanical error in my plane, so United was kind enough to put me in to a cab to Charlottesville. Time passes and my opinion of United had increased to slightly bearable, all else (five or six delayed flights in the past few months) aside. So when I planned to return to California for this Spring Break, ever as ever to see the sunshine, I strode in to CHO airport with bags packed expecting like any normal person to get on my flight home. But see, that’s where I went wrong. I expected United was aware enough about what they were doing that they would still have a ticket with my name on it. What reality told me at 4:30am that day was that I did indeed purchase a return flight to San Diego. However, since I did not board the flight out of Washington-Dulles to Charlottesville back in January, I was considered a no show, and the rest of my trip had been cancelled. Take a moment to comprehend that. I was booted off of a flight because I was a no show on a flight that didn’t exist. Even with years of background in philosophy and logical modelling, I honestly still cannot wrap my head around this. So I booked another flight on the spot in order to get back home before next Wednesday. This of course necessitated I (1) rent a car, and then (2) drive up to Reagan International in DC. And once I arrived in DC expecting a direct flight, the selfish five year-olds that run the airline tapped me on the shoulder. Not only did I have a layover (which under normal circumstances are definitely bearable), but I had (3) two layovers. One in Philadelphia and one in Phoenix. That’s three strikes United. Now I may not be getting my M.S. in Geography, but Philadelphia does seem to be a little bit in… how do we say it… the opposite direction of my destination? And so ended my horror story once I showed up in San Diego, a full twelve hours after I was slated to arrive. And I still haven’t gotten the money back for the flight I purchased on the spot. The one bright spot in this entire situation was that all of the staff I interacted with were very compassionate and empathetic, and tried their very very best to get me where I needed to go. I mentioned earlier my flight from DC to CHO was cancelled for mechanical errors. Well another UVA student had her flight cancelled for weather conditions, which, for some reason, does not get you a taxi ride to your final destination (maybe the bad weather was her fault?). The woman at the customer service desk very sympathetically turned a blind eye to me offering the other stranded student a ride down to Charlottesville, even though it was very strictly against company policy. But even the best employees in the world can only do so much for your company if the processes that it is comprised of are absolute garbage. A company is a network, and like all chains and connections, they’re only as strong as their weakest link. American Customer Satisfaction Index (ACSI) has just listed 9 worst retailers in terms of customer service. More information on customer-service ratings came from the MSN Money/JZ analytics 2012 Customer Service Survey. Another important fact is that customer satisfaction level with online retailers are much higher than with traditional retailers. Click the link to check which 9 retailers are busted.